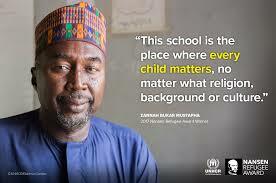 Zannah Mustapha, a champion for the rights of displaced children growing up amid violence in north-eastern Nigeria to get a quality education, has been named the 2017 winner of UNHCR’s Nansen Refugee Award. Mustapha founded a school in 2007 in Maiduguri – the capital of Borno State and the epicentre of the Boko Haram insurgency. The school has stayed open throughout the conflict with Boko Haram, which has seen some 20,000 killed across the Lake Chad region, and millions more displaced. The school provides a free education, as well as free meals, uniforms and health care, to children affected by violence. Those orphaned by the conflict on both sides are welcomed into Mustapha’s classrooms as a sign of the reconciliation he hopes to achieve in the region. The announcement of this year’s Nansen Refugee Award winner by UNHCR, the UN Refugee Agency, comes as tens of thousands of Nigerian youth are growing up without an education. The country’s education sector is strained by its expanding youth population, and facilities in the north-east remain under attack by Boko Haram, who have destroyed schools and killed teachers.